A sculptor and mixed media artist, Di Napoli wanted to include a reference to technology as a symbol of the fast-paced, ever-changing world Iemma operates in. Her fusion of an oil painting technique with a digital image is an attempt to document the personal and professional worlds Iemma inhabits. 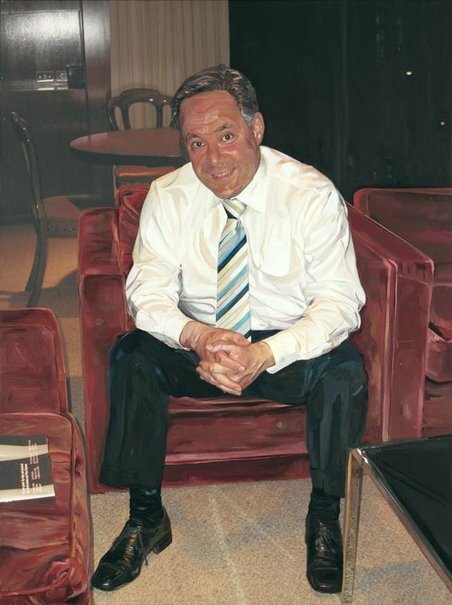 Born in China to Italian parents, Di Napoli spent a brief time in Italy before coming to Australia in 1956, aged nine. She has a Diploma of Art Education from City Art Institute, studied Fine Arts and Italian at Sydney University and art gallery administration at the University of NSW in 1990. Scholarships took her to Japan in 1976 and to Florence in 1990 to study restoration. She now teaches at Co.As.It (Italian Community Assistance), having previously taught visual arts to secondary level students and adults. She was a finalist in the 1994 Portia Geach Memorial Award. This is her first time as a finalist in the Archibald Prize.